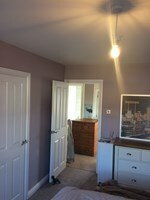 J. Adams Interior & Exterior Painting - Painter/Decorator based in Cradley Heath, West Midlands. Hi my name is Jonathan Adams I have been running my business for 10 years I’m a sole trader the work I provide is anything to do with painting i.e schools,offices, houses factories, both interior and exterior. I live in Cradley Heath West Mids I can travel up to 10 miles but can travel more if need be.